Hanukkah ends tonight. We’ve eaten approximately eleventy million latkes, and Harry has opened nearly as many gifts. (If you dread stinking up the joint with latkes one more time, maybe you’ll do like me and make crispity crunchity smashed potatoes instead.) My birthday was yesterday, and to celebrate I stuffed my face at Pok Pok—more on that another time. Now all that’s left for my interfaith family is to make it through Christmas. I remember feeling that yearning as a kid—and I didn’t even grow up in an interfaith household. I just wanted the dang tree. 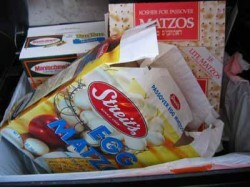 If your family is interfaith, how do you handle it? * Well, reconsidering might not be the right tense. That picture up there? It was taken this morning. Zitner’s Butter Krak: Happy (Addictive) Easter! That’s a lovely tradition, Ellen! Merry Christmas to you & yours! We’re not an interfaith family but we participate in the cultural aspects of holidays other than our own while explaining the religious significance those holidays hold for other families. For example, we do not light a menorah but we make latkes, donuts, and other food together and tell the story of the miracle of Hanukkah and explain what may be done to celebrate in Jewish households and why. I don’t think it sends mixed signals. I think it reaffirms to my children that just as our faith is important to us, different faiths are equally important to different people around the country and world, and helps my children to be well educated and compassionate members of a diverse society. That is a silly article. 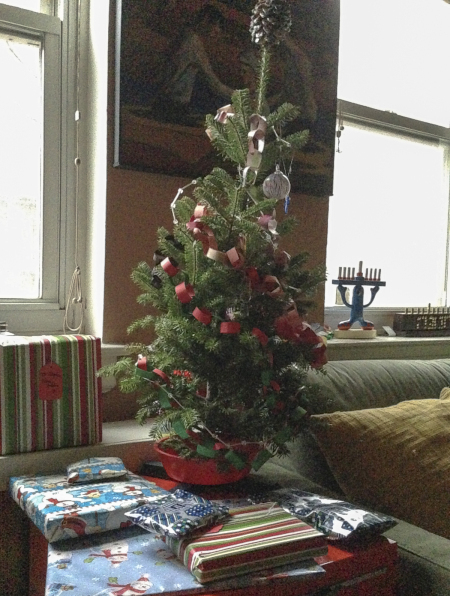 My husband wasn’t Jewish when we married, and our ritual for years was that we started an excruciating conversation sometime in mid-November about whether or not we were going to have a tree. I was willing to do it if he wanted it, and it was always his decision as far as I was concerned. He knew it didn’t feel right to me. The year he decided to study for conversion we said “OK, no more Christmas trees”…and then his family descended on us for Christmas and we had one last tree. When our daughter was little, he took her to his mother’s for Christmas – I always work. At 14, she’s all in for Chanukah and enjoys Christmas as her friend’s houses.